WILMINGTON, MA -- (MARKET WIRE) -- August 8, 2005 -- Frost & Sullivan has awarded Ahura Corporation the 2005 Product Innovation Award for Homeland Security Technologies in recognition of the company's development of the innovative First Defender handheld Raman instrument. The First Defender is a rugged handheld instrument for the instantaneous identification of unknown liquids and solids including toxic industrial chemicals, explosives, chemical warfare agents, and narcotics. The First Defender is designed to the rigorous requirements of the military and optimized to the needs of civilian first responders. It is entirely self-contained, rugged, lightweight, and easy to use. It is the only truly handheld and rugged instrument for on-site identification of unknown solids and liquids by first responders. "Frost & Sullivan recognizes Ahura Corporation with this product innovation award. The First Defender is a truly sophisticated instrument that advances analytical tools available to first responders. We are impressed with the depth and breadth of Ahura's capabilities," said Girish Solanki, Manager of Best Practices at Frost & Sullivan. "Ahura has leveraged its expertise in developing miniature optical subsystems and integrated them into a rugged, waterproof self-contained instrument weighing less than 4 pounds. Beyond the innovative hardware, the company's software algorithms accurately identify unknown substances from a vast internal database of chemical signatures within a matter of seconds." 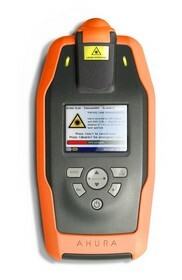 Raman spectroscopy is ideal for these applications because it can identify substances through glass or plastic, therefore the First Defender can be used by first responders to check unknowns that have been collected and triple-bagged in the hot zone for identification in the warm zone, without exposing the instrument or its operator to the substance. In fact, the First Defender can be used in the hot zone and easily de-contaminated with a bleach solution. Since being launched, the First Defender has received a warm response from industry, and has been shipped to numerous federal, state and local first responder teams across the United States to support a wide variety of tactical homeland security operations, including Hazmat incidents, the investigation of toxic chemicals and chemical weapons, custom and border crossing support, forensics, and white powder-type scares. The First Defender is a rugged handheld<br> instrument for the instantaneous identification <br>of unknown liquids and solids including toxic <br>industrial chemicals, explosives, chemical <br>warfare agents, and narcotics.